AUGUST 30, 10:30 PM, THE FIVE SPOT, 1123 EUCLID AVENUE, LITTLE FIVE POINTS, ATLANTA, GA.
ATLANTA, GA - ASIFA-Atlanta continues its co-presentation of the best in independent animation with ANIMATION ATTACK! at the Festival League's Atlanta Underground Film Festival. This year, ANIMATION ATTACK! will span four nights, with three programs of short subjects from Atlanta and around the world, including a special screening of Bruce Bickford's CAS'L. Most famous for his work for Frank Zappa, Bickford is a prolific animator who uses clay. CAS'L will be screened at Eyedrum on August 28th,11pm, with live music accompaniment by local, zany band OMELET. ANIMATION ATTACK! will also screen this year's independent hit, SITA SINGS THE BLUES, by Nina Paley, at the Five Spot on August 30th, at 10:30pm. Animated shorts programs one and two will show at Midtown Art Cinema on Wednesday, August 26th at 8:30pm and August 27th at 9:30pm. Program three will show at Eyedrum on Friday, August 28th, at 11pm, along with CAS'L. The programs of animated shorts include over thirty-five films, selected from submissions to AUFF and hand-picked by ASIFA-Atlanta. Included are films created by local independent animators Em Kempf, Jerry Fuchs, and MT Maloney. New York City is also represented, with films by Signe Baumane, Edmond Hawkins, and the Rauch Brothers. International artists are represented from Australia, Canada, Finland, Great Britain and Germany; a few of the films (BAIT and CODSWALLOP) were picked from being seen at Annecy. Films from ASIFA-Atlanta's monthly collaborative Animation Draw events at WonderRoot will also be shown, as well as an excerpt from "En Transit", a collaborative media work created by Sara Hornbacher, Hartmut Koenitz and Ken Knoespel. Bruce Bickford's CAS'L is a 47-minute clay animation. Bickford is an underground artist best known for his work for Frank Zappa in the 1970's. ASIFA-Atlanta and AUFF are thrilled to be presenting the work in progress, as the soundtrack will be provided by a live performance from local band Omelet! In SITA SINGS THE BLUES, the filmmaker, Nina Paley, is an artist who finds parallels in Sita’s life when her husband – in India on a work projec t - decides to break up their marriage and dump her via email. Three hilarious Indonesian shadow puppets with Indian accents – linking the popularity of the Ramayana from India all the way to the Far East - narrate both the ancient tragedy and modern comedy in this beautifully animated interpretation of the epic. In her first feature length film, Paley juxtaposes multiple narrative and visual styles to create a highly entertaining yet moving vision of the Ramayana. Musical numbers choreographed to the 1920's jazz vocals of Annette Hanshaw feature a cast of hundreds: flying monkeys, evil monsters, gods, goddesses, warriors, sages, and winged eyeballs. A tale of truth, justice and a woman’s cry for equal treatment. Sita Sings the Blues earns its tagline as "The Greatest Break-Up Story Ever Told." 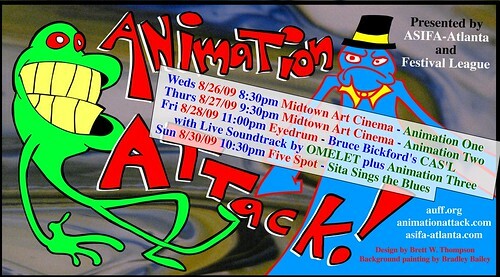 ANIMATION ATTACK LIVE, including the performance of CAS'L with OMELET will screen on August 28, 11:00 PM at the EYEDRUM, 290 Martin Luther King Jr. Avenue, SE, Atlanta, GA.
SITA SINGS THE BLUES will screen on August 30, 10:30 pm, at THE FIVE SPOT, 1123 Euclid Avenue, Little Five Points, Atlanta, GA. Individual tickets will not be available on-line this year. Tickets are available at all venues box offices 30 minutes prior to screening, first come basis.